There has been no time in modern history when leadership is more important than it is today, a retired executive with the nation's largest insurance company told an audience at Indiana State University. But "there is a leadership vacuum in America which tends to permeate across virtually all spectrums of our lives," Jack North, a former State Farm senior executive vice president said Tuesday during a presentation on "The Art of Leadership and Being Led." North addressed more than 100 business students, Indiana State faculty and staff and Wabash Valley businesspeople. His presentation was hosted by the Gongaware Center for insurance, risk management and financial services in Indiana State's College of Business and was sponsored by State Farm. Leadership is "the thread that binds successful businesses together or, when it unravels, allows businesses at best to decline and at worst to fall apart," North said. Describing how he put himself through college by working at a Pennsylvania steel mill before becoming a teacher and coach, insurance salesman and ultimately an executive, North said he "only dabbled in the insurance business" but was "knee deep in the people business." He reeled off a list of leaders both good and bad, a list that seemed to suggest a time frame for when the nation's current leadership vacuum emerged. He spoke of Abraham Lincoln, Andrew Carnegie and business leader Lee Iacocca, who saved Chrysler Corp. in the midst of a major economic downturn in the early 1980s. He then reeled off the names of celebrities such as Cher, Celine Dion and Oprah Winfrey before turning his attention to the likes of Gordon Gekko (Michael Douglas' character in the 1987 movie "Wall Street"), and Bernie Madoff, real-life head of NASDAQ in 1989 who is now awaiting sentencing for a $50 billion investment fraud scheme. "Unfortunately we equate leadership to people with big jobs and big titles. That's a mistake. I will argue that every one of you to some extent must exert leadership skills and attributes in your daily lives," North said. The best way to lead people, according to North, is by influence rather than authority. "You can lead people with intimidation and threats but the great satisfaction that comes from true leadership is when the person doesn't have to do what you're asking them to do," he said. People also want leaders to tell the truth, he added, proclaiming that "trust is the bedrock of leadership." Americans have embraced President Barack Obama's leadership "because they so desperately want to be lead," North said. "I'm going to give him as much opportunity as I can give him, whether I agree with his politics or not, because I desperately want the American people to be led by someone they can trust." North listed his "Two Bs and Five Cs" of success, quipping for the largely student audience that he was not talking about his last college report card but about balance, basics, commitment, credibility, communication, compassion and character. North advised students to focus on the job they have today, work hard and maintain a positive attitude. "So many young people, particularly gifted ones, will be aspiring to some big job. Unfortunately if you wear that on your sleeve it's absolutely striking how often that backfires," he said. "Do your job today really well and I promise you if you take that to heart the next job will come a lot more easily than if you advertise it." While opportunities remain, success in America "is no longer on cruise control," he said. "Everybody in this room, particularly you younger people, needs to fight to maintain America as a land of opportunity." Indiana State business students who listened attentively to North's more than hour-long presentation embraced his message. "It's a very crucial time to be talking about this topic. Our generation is expected to get out of college and turn things around. People are looking for good leadership. It's great that he's coming to Indiana State and speaking with us about that," said David Walters, sophomore insurance and risk management major from Valparaiso. Alyse Houghton, sophomore finance major from Plymouth, called North's speech inspiring. "Everyone here is trying to become a better leader, a better student, and more balanced in everything they do. He talked about some tips that will help us accomplish these things. Having a positive attitude is very important. Hearing that from someone who has been so successful is very encouraging," she said. 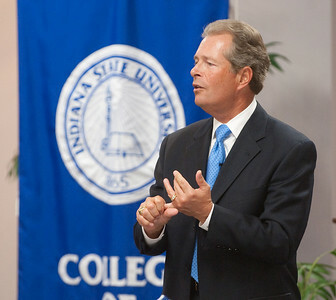 Photos: Making a point - Jack North, retired senior executive vice president of State Farm Cos. spoke at Indiana State University March 24 as part of the Gongaware Center Leadership Series. (ISU/Tony Campbell)Veteran leader meets future leader - Jack North, retired senior executive vice president of State Farm Cos., chats with Abigail Schmitz, a sophomore marketing major from Charleston, Ill., following North's "Leadership and the Art of Being Led" presentation March 24 as part of the Gongaware Center Leadership Series at Indiana State University.